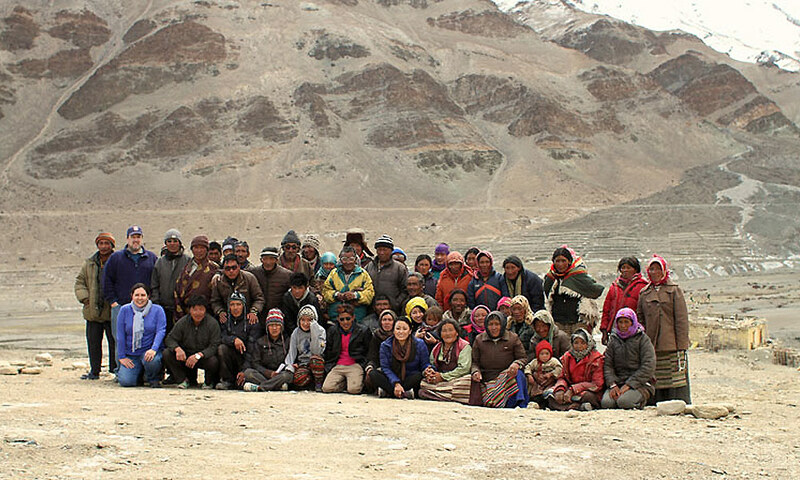 This community photo, taken in the Changtang nomadic region more than 15,000 feet above sea level in the Indian Himalayas, includes Timothy Dye, professor of obstetrics and gynecology, his research collaborators from the University of Hawaii, representatives from the Central Tibetan Administration's Health Department, and the Changtang villagers the team visited to assess the understanding and impact of hepatitis B among Tibetan refugees, and to devise a plan to detect, treat, and prevent the disease. University of Rochester research often has a global reach. And there is no better example of that than the work Timothy Dye, professor of obstetrics and gynecology, is conducting in India with colleagues to assess hepatitis B among Tibetan refugees. The project, funded by the Hershey Family Foundation, is being conducted in cooperation with the Central Tibetan Administration’s Health Department and the University of Hawaii. By the end of this year, Dye will have made three trips to the Ladakh district — in the northern Himalayas where the borders of Pakistan, India and China converge — as part of an effort to help Tibetan authorities come up with a strategy to detect, treat and prevent the disease. That’s about a 17,000-mile round trip each time. But a lot is at stake. Many populations throughout Asia, in general, are known to be at a higher risk of hepatitis B, but assessing its impact among Tibetan refugees is especially important, Dye explained. “Tibetans are scattered throughout the region in isolated camps that don’t have a lot of resources, in a very harsh environment to live,” said Dye, who is working with two collaborators from the University of Hawaii. Refugees sometimes have an unclear understanding of hepatitis B, which is transmitted by a virus. Those who have the disease are often unable to afford expensive antiviral medications and opt instead for more accessible Tibetan medicines that seem to help manage symptoms. So, after gaining necessary governmental approvals during an initial trip in February and ethical approvals from the appropriate sources, Dye and his collaborators returned in May. They conducted a qualitative community assessment, employing classical anthropological field methods to get a better idea of how Tibetans themselves perceive the disease, how they treat it, and how they respond to those who suffer from the disease. The findings will help their Tibetan Health Department colleagues craft a strategy that takes into account cultural beliefs and practices, and will thus have a better chance of being accepted. Dye and his colleagues were there to conduct a qualitative community assessment, collecting “illness narratives” and “explanatory models” to help better understand how the Tibetan refugees perceive the disease and its circumstances. This involved end-of-the-day, open-ended discussions with focus groups of 10 to 15 people each, lasting two to two and half hours, followed by one-on-one interviews with anyone who actually had the disease and who consented to talk about it. “We wanted to know peoples’ stories, how they believe the disease is caused, how it works, how it is treated, and what are the social and medical consequences,” Dye explained. The Tibetan team provided basic health education about hepatitis and answered peoples’ questions, and were very well-received. Involving the local clinical team was invaluable, since they connected with people and provide very practical information. Dye plans to return to the Ladakh district in November to discuss the assessment findings with the team and the Tibetan government-in-exile. The next step: Working with the Tibetan Health Department to devise a strategy to detect, treat and prevent the disease.